Warner Bros. Pictures announced today that Anne Hathaway has been cast as Selina Kyle (AKA Catwoman) in Christopher Nolan’s The Dark Knight Rises. She will be starring alongside Christian Bale, who returns in the title role of Bruce Wayne/Batman. Christopher Nolan stated, "I am thrilled to have the opportunity to work with Anne Hathaway, who will be a fantastic addition to our ensemble as we complete our story." In addition, Tom Hardy has been set to play Bane. Nolan said, "I am delighted to be working with Tom again and excited to watch him bring to life our new interpretation of one of Batman’s most formidable enemies." The City of Iloilo and the Film Development Council of the Philippines (FDCP) have launched, this week, the first major Philippine film festival outside Metro Manila, the Sineng Pambansa Iloilo Film Fest 2011, the first of what is destined to go on as an annual series. This film fest showcases the country's best films made by the "indie" film community. The screenings of the Film Fest is actually FREE ADMISSION, you don’t have to pay a single centavo to watch these movies. Regular audiences would get to watch internationally acclaimed Pinoy movies like Himpapawid, Bakal Boys, Yanggaw, and many more. According to the chairman of the FDCP, Briccio Santos, there are plans to make this event an annual series, with a wider scope that would include short films and ilonggo films, additionally the next festival will also possibly one that would include international films, and would include workshops and symposiums to go along with it. He is very much happy that the FDCP has this mutual cooperation with the city government to make this event possible. The event formally opened last Wednesday January 19, 2011, first with a press conference at Hotel Del Rio in the afternoon, then on that evening was a red carpet event and cocktail party which was followed by an opening program that formally launches the event. That program featured a number of impressive musical numbers both locally here in Iloilo, and from Metro Manila as well. The movie that was screened directly after the program was Jim Libiran’s HAPPYLAND. The entire Film Festival will be a series of screenings of various films on SM Cinema 2 and 3, from January 19, 2011 up until January 21, 2011. The Festival closed in the late afternoon of January 21, 2011 with the closing film EMIR by Chito Rono, which was greeted by an overwhelming number of audiences that it literally filled up the SM Cinema 3. It even kinda reminded me of the good old days of moviewatching, when audiences would literally sit on the floor because the moviehouse is really filled up. A fitting ending to what is a milestone event for our city and for Philippine Cinema, of what is destined to be a great film festival that will continue for generations. 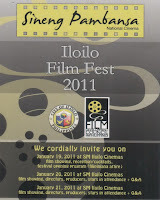 The Sineng Pambansa Iloilo Film Festival 2011 will be held from January 19, 2011 to January 21, 2011. The venue of the event will be on SM City Cinema (specifically Cinemas 2 and 3). Several Movies will be shown on the said dates, and on some specific dates, the screening will be coupled with a Question and Answer segment between the audience and the Director/Producer/Stars in attendance. The Iloilo City government will host the screening of some eleven independent films for free in Cinemas 2 and 3 of SM City Iloilo starting January 19 to 23, 2011. 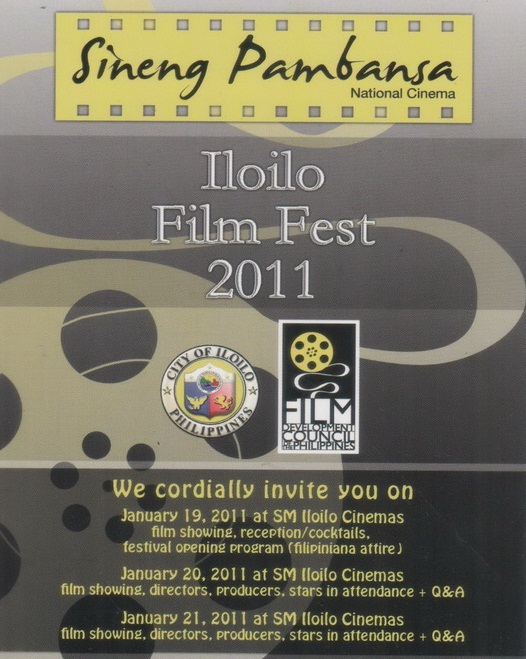 The critically acclaimed indie movies are the feature films in the “Sineng Pambansa Iloilo Film Festival 2011”, a project spearheaded by the city government in cooperation with Film Development Council of the Philippines which is under the Office of the President. The 11 films include “Lola”, “Sigwa”, “Red Shoes”, “Bakal Boys”, “Halaw”, “Himpapawid” (Manila Skies), “Sampaguita”, “Yanggaw”, “Kano”, “Happy Land”, and “Emir”. According to the Iloilo City Information Office “Yanggaw” of Richard Somes is the sole Ilonggo feature included in the film festival. The City Information Office said that Mayor Jed Patrick Mabilog worked out the realization of the film fest following his meeting with FDCP Chairperson, Usec. Briccio Santos as part of his efforts to show the Ilonggos’ awareness in movies, culture and arts. Likewise, the event will highlight the city’s capability to host film event and draw art patrons. Some of the dignitaries invited to attend the formal launching and grand opening program on January 19 are the Ambassadors of France, Italy and other European countries. Also, expected to perform during the program include renowned Filipino pianist Raul Sanico and popular Ilonggo artists.